What is a Sponsored Challenge? ESRA seeks sponsors willing to host "Challenges" within the existing Spaceport America Cup (SA Cup) framework. ESRA considers a "Challenge" to be any technical requirement levied on participating student teams in addition to the requirements of the Intercollegiate Rocket Engineering Competion (IREC). Such requirements are assumed to be aligned with the expertise and interests of the sponsoring organization. Challenge recurrence from year to year remains entirely at the sponsoring organization's discretion. Similarly, sponsoring organizations may choose to alter the requirements of their challenge from year to year. In the future, the SA Cup may include events in addition to the IREC, which can also feature Challenges. 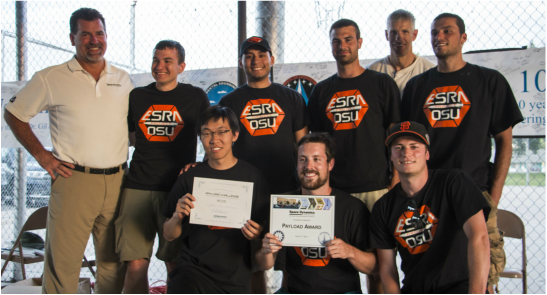 SDL representatives present a $700 award to an Oregon State University Team for winning the First Annual SDL Payload Challenge. $300 was awarded to the second place team - from Concordia University. What is Required to Sponsor a Challenge? Defining the Challenge's rules, regulations, and judging criteria: While all Challenges must ultimately be approved by ESRA and the New Mexico Spaceport Authority (NMSA; aka Spaceport America) to ensure they do not contradict any rules and regulations governing the IREC and SA Cup as a whole, Challenge sponsors are entirely responsible for defining their Challenge - what teams must do to compete in the Challenge, how they will be evaluated, what constitutes a disqualification, etc. This information may be made available for viewing by the competitors through either ESRA or the sponsor's website. Answering Challenge-specific questions from competitors: Challenge sponsors must make themselves available through either phone or e-mail to answer student's questions concerning the challenge. Receive and evaluate Challenge-specific "deliverables" as necessary: Once a Challenge is announced, student teams wishing to participate in the Challenge will be asked to contact the sponsoring organization directly. As part of the Challenge, the sponsoring organization may request additional information from participating teams in the time leading up to and during the SA Cup; however, the sponsoring organization will be responsible for receiving and evaluating these required deliverables. Any progress reports ESRA requires from student teams as a regular part of the IREC (or any other ESRA hosted event) will be made available to Challenge sponsors for their awareness and use as they see fit. Provide rewards for winning the challenge: Challenge sponsors must provide rewards for winning the challenge. Awards may include, but are not limited to, trophies, plaques, money, and internship opportunities. Ultimately, the nature of the award is entirely controlled by the Challenge sponsor. 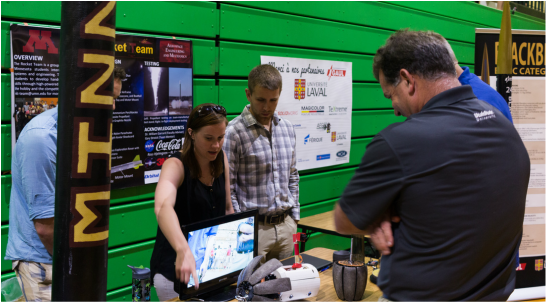 The Utah State University, Space Dynamics Laboratory (SDL) hosted the first sponsor challenge at the 10th IREC in 2015. Reflecting SDL's expertise in the field of space-rated sensor payloads, the SDL Payload Challenge rewarded the student team who best demonstrated technical excellence in the area of scientific payload design, manufacturing, and performance. While the IREC rules and regulations stipulate the minimum payload mass competing designs must loft, student teams choosing also to compete in the SDL Payload Challenge needed to further ensure some part of this mass was more than "dead weight" - having some experimental function. There are almost no limits on what may constitute an acceptable challenge. So long as the proposed challenge does not directly contradict ESRA's regulations governing the IREC, our competitors may accept it! The IREC requires student teams to launch and recover no less than 8.8 lbs of payload to either 10,000 or 30,000 ft above ground level. The complete rules, requirements and expectations of the IREC are defined by the documents found on the SA Cup Documents & Forms page, beginning with the IREC Rules & Requirements Document. (Note: In the future, the SA Cup may include events in addition to the IREC, which can also feature Challenges.) ESRA encourages prospective Challenge sponsors to devise problems unique to their organization's interests and specialties. The table above contains possible ideas/examples. Have an idea for a challenge, but are unsure whether it may be implemented? Contact Us and we can most likely work something out! Challenges offer sponsoring organizations unique opportunities to self-promote and recruit new talent. As a Challenge sponsor, your organization will interact directly with hundreds of highly motivated college students, studying a wide variety of science, technology, engineering, and math (STEM) disciplines. Over 600 students, from 50 colleges and universities participated at the 11th IREC in 2016! The IREC provides these students an unparalleled outlet to demonstrate their mastery of traditional as well as innovative solutions to real-world aerospace design problems by designing, building, and flying actual launch vehicles and payloads! Furthermore, all sponsors are highly encouraged to conduct outreach at the SA Cup. Hosting a Challenge is a powerful marketing tool, showing the sponsoring organization's support for STEM education, while simultaneously highlighting the organizations products and services, and all for relatively low cost. Please contact us for more information on creating your own IREC Challenge!